Hi everyone...Travis back with some Tampa Bay area events that will keep you healthy, even though you&apos;ll be dead tired in the end. 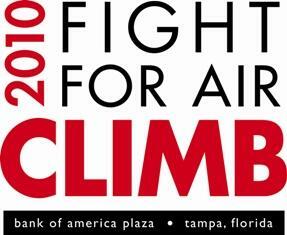 We are talking about the annual Fight For Air CLIMB TAMPA. This is a stairclimb event where runners or walkers huff and puff their way up the 42-floors, 914-steps in the Bank of America Plaza in Downtown Tampa. The stairclimb will bring athletes and challenge-seekers together to support the important work of the American Lung Association. Professionally timed and ranked, this vertical challenge attracts a wide range of participants, including novice to professional athletes, firefighters, police, military, corporate teams, families and lung champions. It happens this Saturday from 7am to 1pm, although we hope it won&apos;t take that long to get to the top. It&apos;ll be at the Bank of America Plaza at 101 East Kennedy Boulevard, Suite 3875. Definitely head to the website (www.FightForAirClimbTampa.org) to get more information and try to make it out to this one...you won&apos;t regret it. See you back here for more Tampa Bay entertainment options and great things to do in Tampa Bay.